There are currently only three ways to reach Lumbini from anywhere in Nepal. By far the most popular method is by bus. While the fastest but most expensive is by flight. I’ve taken these journeys on many occasions. The truth of the matter is, Lumbini is not the most convenient place to reach when it comes to transport. But, with a little planning, it becomes much easier. Take a look at the distances from Lumbini to other destinations below and it starts to make a little sense. Lumbini is 272 KM from Kathmandu, 169km from Pokhara. 131 km from Sauraha (Chitwan) and only 28 km from Sunauli (border with India). Trust me, reading this will help. Because there is no direct bus to Lumbini, many travel agents will start to mention different towns or places. Lumbini – this means Lumbini bazaar where the accommodation and Buddha’s birthplace is . Bhairahawa – this is the main town 20km from Lumbini which has a large bus station and airport. Most transport comes close to here. Butwal – This is another major town in Nepal which is a transport hub. It’s a little further out from Lumbini and is normally where local buses will stop from around the country before you get off and get another bus to either Bhairahawa or Sunauli There are sometimes buses to Lumbini bazaar, but you’ll likely be waiting. It’s faster to just jump on the next bus to Bhairahawa and transfer there. Buddha Chowk – This is the junction where most buses will drop you from coming from Kathmandu, Chitwan or Pokhara. You simply get out, cross over the road and walk down the main road opposite and get a local bus to Lumbini Bazaar. If the above seems like too much. Don’t worry. Just use the places as reference names so you will have an idea. The most important thing is to know where you are leaving from. This is the most popular transport option to reach Lumbini. Put your mind at rest that from just about every major city there will be a bus route to Lumbini with travel agents and hotels offering you pre-booked tickets. Pay no attention to the words “deluxe” “tourist” or “executive”. There is no standard in Nepal. Do pay attention if they have A/C or not. This is key, especially in the summer or monsoon season. Greenline, have not done this route for years so ignore the outdated internet blogs and guidebooks. There is no direct bus though. At least not a regular service that’s survived more than a year. Many travel agents will tell you there is, but there isn’t. They will instead sell you a ticket to Bhairahawa, which is just 20 minutes from Lumbini and this is fine! Don’t worry. Not only does Bhairahawa have a big bus station, but the chances are you’ll be dropped off at a junction and will just have to take a local bus for 20 minutes to Lumbini Bazar. Easy. Lumbini is 272 KM from Kathmandu. Of all the destinations in Nepal the capital is the furthest and makes getting to Lumbini the most awkward. My advice? Keep it simple. Book with a travel agent or your hotel, take a taxi the next morning to the bus stop. Off you go. Most “air conditioned” buses to Lumbini depart from Kathmandu’s Kalenki bus station. This will mean you’ll need a taxi in the morning to reach Kalenki. There are two types of buses with randomly changing names. Deluxe and Deluxe A/C. The more expensive is the A/C one which is mildly more comfortable. It’s probably worth it too. Personally, I would not take the night bus. They are simply not comfortable. Some would say the roads are too bad at night too. Alternative buses: missed the bus? Grab one from Kalenki to Bhairahawa. It’s basically the same thing. Bhairahawa is a much better option than Butwal as it’s closer to Lumbini (20km). Virtually all of these buses will drop you at Buddha Chowk and not downtown Lumbini Bazar. Don’t worry. This is again normal. Just hop out, cross the road. Walk down Buddha road and get a local bus to Lumbini bazaar. Nearly every local along that main road will point you in the right direction. Finally, if you read the distances at the top of the page, you’ll notice other popular destinations in Nepal are closer to Lumbini. It is my experience that it’s a lot easier to visit Lumbini from one of these locations than Kathmandu. So, if you want to visit Lumbini, but are also visiting Pokhara or Chitwan … then visit these first before visiting Lumbini – it’s so much easier than Kathmandu! Lumbini is 169 KM from Pokhara. Things are much easier if you want to visit Lumbini from Pokhara by bus. There are two options. One from the tourist bus park at 6am-7am. The other is from Pokhara’s new bus park which have a morning and a night bus from around 6am-7am and around 10pm at night. The tourist bus park option is the easiest and most comfortable. It’s also nearest to Lakeside. Book a ticket with travel agent. Turn up in the morning, off you go. Otherwise from the New bus park you’ll get a slightly older bus. Both bus options will drop you at Buddha Chowk near Lumbini and Bhairahawa. You simply hop out, cross the main road and head down Buddha road opposite and get a local bus on the left heading to Lumbini (20km). A local bus costs 20 rupees but someone cheeky might charge 50 rupees. If the bus is empty, the 50 rupees is fine if you can bring your bag on board. Otherwise it ends up on the roof. It’s not a problem. Of all the tourist destinations in Nepal, Chitwan to Lumbini is the fastest, shortest and easiest. This is local style bus. It’s not A/C. For luxury buses you’ll be hard pressed and will have to travel further out to get one. Just book the bus from your hotel or resort and the next morning they’ll drop you off at the tourist bus park (7am). You can go there yourself too. There’s a local bus here. It’s going to Bhairahawa. After 5 hours you’ll be at Buddha Chowk near both Lumbini and Bhairahawa. Hop out. Cross the road and go down the long road opposite. There are local buses headed to Lumbini bazar here. It’s about 25 km away to Lumbini. There are so many travel agents here hawking buses it won’t be hard. Just try to avoid being cheated. Any bus to Bhairahawa will do. Grab any bus going to Bhairahawa. Chances are every other bus company will say they go direct to Lumbini … they will all likely drop you at Buddha Chowk just like above. Yes, thankfully getting back from Lumbini to Kathmandu, Chitwan or Pokhara is much easier. There are even some direct bus routes during peak season. Otherwise, Bhairahawa bus station is your friend. Just beside Lumbini bazar is a small little bus stop. Take a left from the top of Lumbini bazaar and it’s two streets away to the left. Sukura bus no longer operates, so ignore the outdated online reports. Every year bus companies tender for the routes. So, the companies often change. The current bus company offers direct buses to from Lumbini to Kathmandu. They’ll drop you near Balaju where you can grab a taxi. They have two types of bus. Deluxe and Deluxe A/C. Just grab the Deluxe A/C. There’s no guarantee of A/C but the bus is slightly better. Just like above, there is now a sometimes regular direct bus from Lumbini to Pokhara … but, it’s not always running. Don’t worry. If it’s not, just book through you hotel for a bus to Pokhara. They’ll organize you to be dropped at Bhairahawa where the buses depart from. Buses arrive in Pokhara’s New Bus Park where you take a taxi to Lakeside etc. If going independently, your grab a local bus in the morning outside Lumbini bazar to Bhairahawa bus park. Or, failing that to Buddha Chowk where you’ll get a bus to Bhairahawa where there are morning buses to Pokhara. The easiest option is to book a bus from Lumbini to Pokhara through your hotel. This way, they’ll have a minivan or car which will take you to Bhairahawa. My advice is to ask them about the cost before booking. If it seems high, then ask at one of the many travel agents along Lumbini bazaar. The main issue is getting from Lumbini bazaar to Bhairahawa in the morning. From Bhairahawa to Pokhara the buses are the same and prices are posted outside. Most depart around 7am. You’ll need to depart from Bhairahawa bus stop for this bus. Just like the Pokhara bus above, it’s very easy once you can get to Bhairahawa. The biggest obstacle is the commission some hotels put on these tickets. It’s not a lot. We’re talking USD$5 plus. But, it’s annoying. Ask around the travel agents if you think your hotels is charging too much. Once at Bhairahawa you’ll need to ensure your bus goes to Chitwan (Sauraha tourist bus park). There’s usually a bus in the morning about 7am. Kathmandu to Lumbini by Car. Pokhara to Lumbini by car or even Chitwan to Lumbini by car are all pretty much the same aside from shaving 1 hour off the bus times. Hiring a private car and driver is an option for those short on time or who are looking for some comfort. All starting destinations will have a private car hire option. You’ll need to negotiate the price which will likely be pretty much the same as you’ll be booking a car for the day rather than just to the destination. Average car with driver hire price: USD$80-120 per day. Yes, it’s not cheap at all. The higher prices are for Air-conditioning. You’ll pay more again for a 4x4 or jeep. If there’s a group of 4 or more, then the price becomes easier to handle. Most jeeps can carry up to 6 -7 people. So splitting the cost is an option. The problem is getting a car hire from Lumbini to Kathmandu, Pokhara or Chitwan … they are not easy to find. Many people simply hire a car and driver for 2 days. They leave early in the morning, arrive in Lumbini, do some sightseeing then the next day head back. Flying to Lumbini means your journey will only be 45 minutes. But, the airport is in Bhairahawa. So, you’ll need to factor in the cost and time from Bhairahawa to Lumbini too. About 30 minutes and or 1000 rupees for a taxi. Flights are better purchased through local travel agents than online or directly though an airline. The reason for this is basically due to delay or cancellations. Travel agents can do this easily, otherwise you have to end up doing this yourself and it takes a lot of time and effort. The is little price difference between all three options. Airlines offering flights to Lumbini change quite a bit. Buddha Air and Yeti Airline are the two more poplar airlines. Do note that although the service has been running a while. Cancellations on Pokhara Lumbini flights and stoppage of service has happened in the past. The flight time is about 20 mins. This is the new “Bhairahawa” airport. It’s a new airport, terminal etc, but it’s practically the same location as the old airport just with a new name and facility. They are hoping to make it into an International standard airport with a fast track road to Kathmandu (5 hours). There’s a lot of talk about Gautam Buddha Airport being the new international airport of Nepal instead of Kathmandu. The likelihood of this happening is very slim. The “Fast-track” road still means a 5 hour journey to Kathmandu. A long distance when you take into account the road standards in Nepal. Gautam Buddha Airport will most likely be used as a regional airport serving flights from India and China. Railway station and trains to Lumbini? There are no trains to Lumbini. The nearest train is in India and it doesn't reach the border with Sunauli There is talk of expanding Nepal’s defunct railway network but it’s probably about a decade or so out. This is a relatively easy journey. There are two choices, either fly into Bhairahawa airport or travel overland from India to Nepal. Lumbini is very close to the border and makes for a good stopover before continuing on to the rest of Nepal. As you’ve read above the journey to Lumbini basically means it’s not a direct route. That said, it’s not too difficult at all once you plan out your logistics. Over the years I’ve learned to avoid the Kathmandu to Lumbini route. It’s long, dusty and costs a little more. Coming back from Lumbini to Kathmandu by bus is a lot easier. For me, I nearly always plan a journey to Lumbini from Chitwan. It’s only 5 hours away and an easy journey to make. At a push, Pokhara to Lumbini is also easy if there’s a direct bus leaving from Pokhara bus park. In both cases the buses drop you off at Buddha Chowk. See the map below. You just cross the road, walk down the road opposite and grab a local bus from the left side of the road. On the way back? I try to grab a direct bus from Lumbini to Kathmandu from Lumbini bazar. Or, just go to Bhairahawa and get a bus to Pokhara or Chitwan. I hope this helps you on your journey. Do check out my online travel guide to Lumbini. 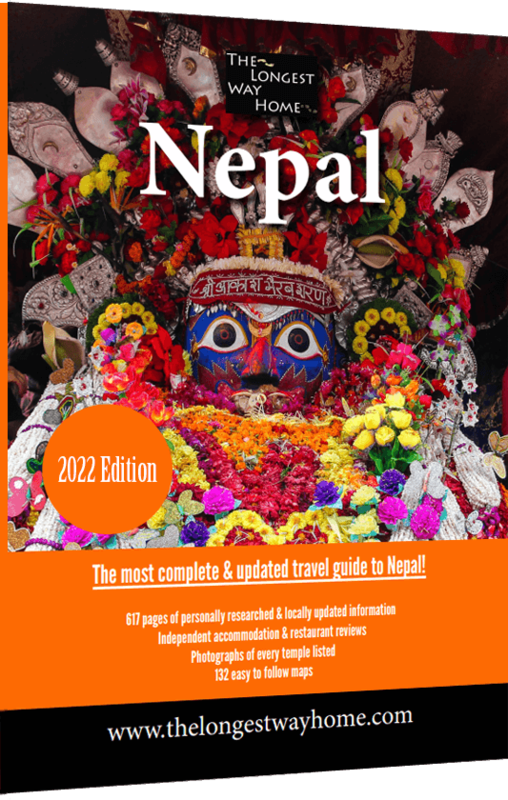 And, for an in depth insider guide that covers all, do check out my guidebook to Nepal. Full directions to Lumbini and maps are available in my guidebook below.